When I realized that my Paleo-Wholetarian Pancakes tasted like old-fashioned donuts I figured it would work for donuts as well so I tried it and it sure did. So this is the exact same recipe as my Paleo-Wholetarian Pancakes. 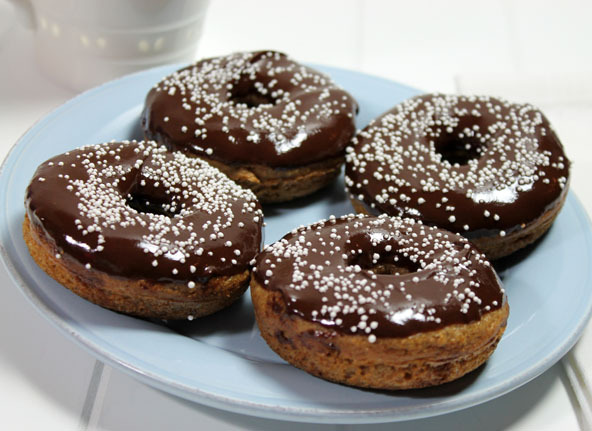 I just titled it here as Chocolate Frosted Donuts and changed the preparation to make donuts. 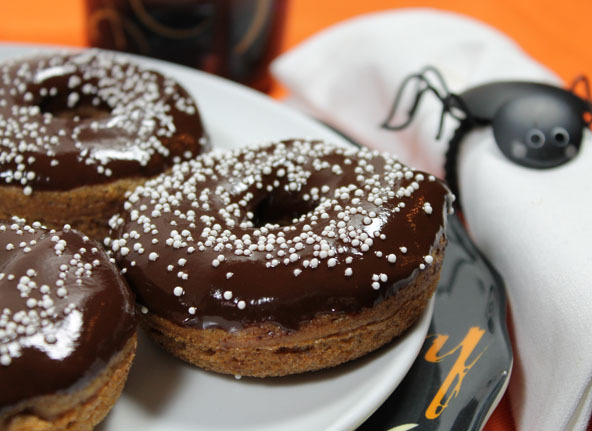 These donuts can be frosted with the chocolate frosting recipe below or drizzled with Wholetarian Blend Pancake Syrup tasting more like old-fashioned donuts. Both are delicious. Whisk eggs together in a medium mixing bowl. Add the remaining ingredients except the coconut oil for greasing the pan and whisk together. Spread the coconut oil onto the donut pan indentations. Spoon the batter into the donut molds. It’s a little tricky since the batter is thick. Place pan in a pre-heated oven at 350 degrees. Bake for 11-12 minutes. 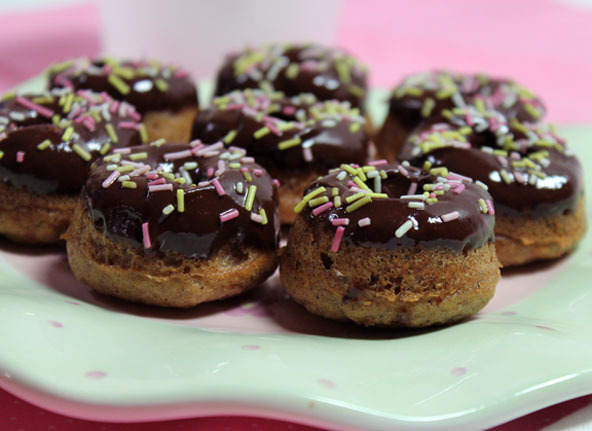 For mini donuts bake for 9-10 minutes. Remove from the oven. After a few minutes remove the donuts from the pan with a small rubber spatula. Drizzle with Wholetarian Blend Syrup or try the following Chocolate Frosting. The following chocolate frosting recipe is for a full cake. Half this recipe for these donuts. A chocolate melting pot or small crock pot works well for this recipe or you can use a double boiler. If using a double boiler, put a couple of inches of water in the bottom pan. Place the upper pan on top and add all of the ingredients. Turn the stove on medium-high and stir together as it slowly melts. Once it has all melted together, It’s ready to drizzle on but if you want it a little firmer, transfer it to a bowl and place it in the refrigerator to stiffen up a bit. Check it after 10 minutes or so and give it a stir. When it’s the right consistency, remove from the fridge and frost your treat. I used” Nature’s Colors” String of Pearls by India Tree to sprinkle on top of these donuts. I used “Let’s Do Sprinkelz Carnival”- Colorful Vegan Toppings for these mini donuts.